Outstanding bit of public service sleuthing, yes? He says it right there on the first page that he's doing it for the benefit of the industry. Noble. It almost makes us want to drop serious copper into the World Gem Society coffers because this chap is obviously looking out for us. 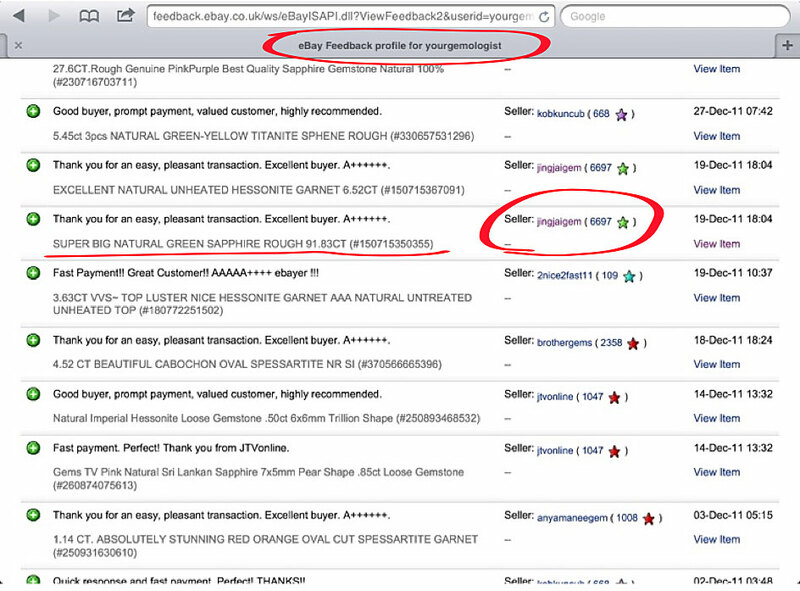 We discovered that YourGemologist is active on eBay. The profile from the International School of Gemology's head says he's been a member since 1999 and his feedback sits at 100%. 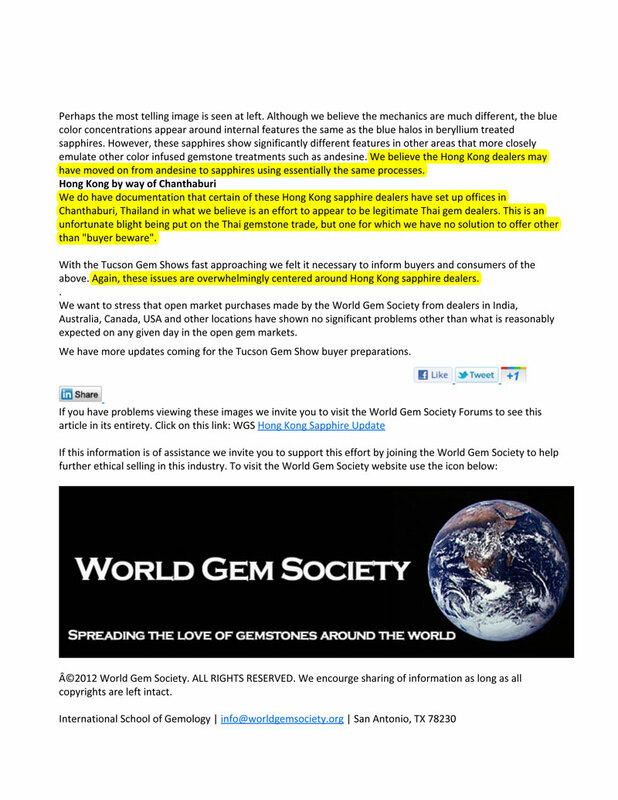 On Dec. 14th, 2011, the International School of Gemology/World Gem Society's YourGemologist (Robert James) purchased a 91.83 ct green sapphire from a eBay vendor in Thailand by the name of Jingjaigem for $1.25. 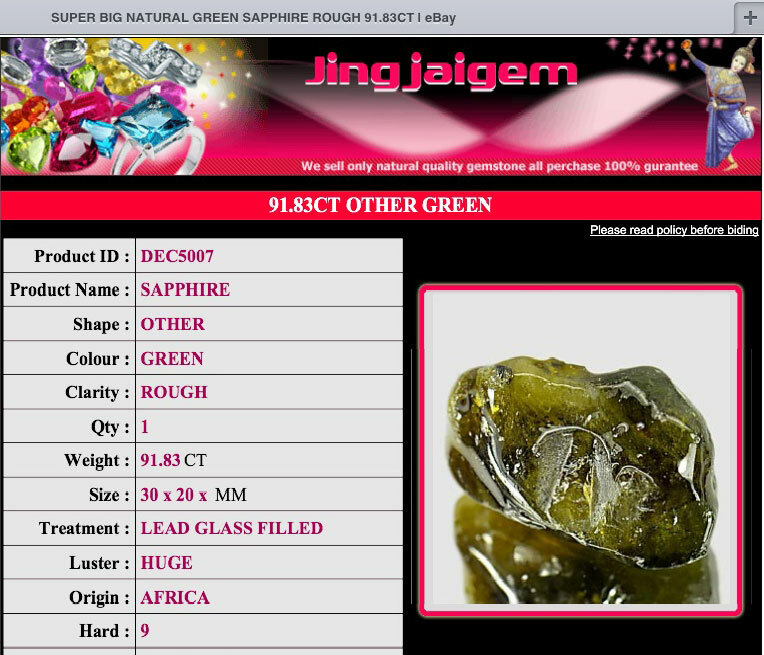 Jingjaigem also ensures fast delivery as we had occasion to discover. We ordered something from him and the parcel arrived a few days later bearing Thai stamps, a Thai postmark and a Chanthaburi return address. Goodness gwacious! Do we see what we think we see? Mr. "YourGemologist" Robert James often talks about his quaint "Old Geezer" rule. Perhaps he had an Old Geezer memory moment here? After all, Hong Kong/Thailand, it's still Asia. Texas/New York, same same, wight? Okay, we know, some people are horrid at geography. One of the beauties of the internet is that it tends not to have those memory lapses. 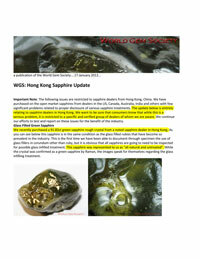 So let's take a wee little peek and see what Jingjaigem had to say about this stone when he was selling it. Webel, webel, you sure did know. Hot twamp, I no love you no more! We're going to take the International School of Gemology's Robert James at his word when he stated at the end of his report that he was fine with sharing it, providing that the copyright remained intact. So we'll share it with you, and will continue to share more in the future. 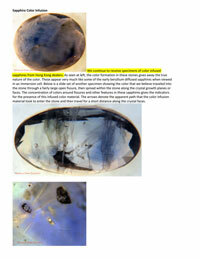 Copyright of said material belongs to the World Gem Society. "I now own JefferyBergman.com. I am not sure whether to spend the money to file a lawsuit, or just totally disembowel the guy on an internet basis…." No lawsuit was filed. Bergman still has bowels intact. "Banned....... LMAO. I just don't choose to participate." 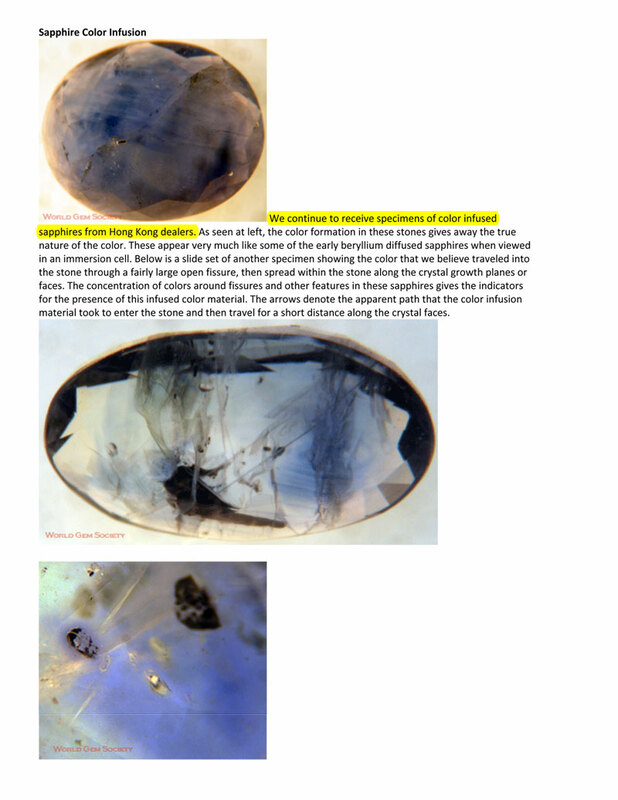 "We were the first to discover andesine, tourmaline and garnet diffusion." "I did not actually uncover this thing but reported on our confirmation of other's findings previously." "If you have the huevos to do it, you can get away with it." "Let 'em get burned once. Might do 'em good." "Profits are nobody's business but the seller." "We don't recognize the GIA and would never submit a stone to them." "As a GIA Graduate Gemologist I can tell you that the GIA training is very good with a long history as the most famous gemological education organization in the world." We are the Gobsmacked Gang, those who cannot believe the things that spring from the mouth of the International School of Gemology's Robert James, the Mr. Bean of the gemmological world. Please note that the Gobsmacked Gang has nothing to do with what appears to be yet another Robert James attack site FakeGemology.com, which is designed to hurt someone making an honest attempt at teaching gemmology. Once again, as is copiously detailed on our Files page, James reveals what an evil little spawn he is. We would pray for his soul, but there is no evidence he has one. Thus we suggest a career change. A man like this certainly belongs in the Trump administration. "If I were to catch any of my ISG Registered Gemologists or Registered Gemologist Appraisers trying to pull the stunts that you are pulling on eBay, I would pull their diplomas, publicly expel them from the ISG, and personally make sure that they did not work again in this industry with anything but a broom in their hand." "They [the insurance industry] do not take kindly to frauds being perpetrated on consumers." 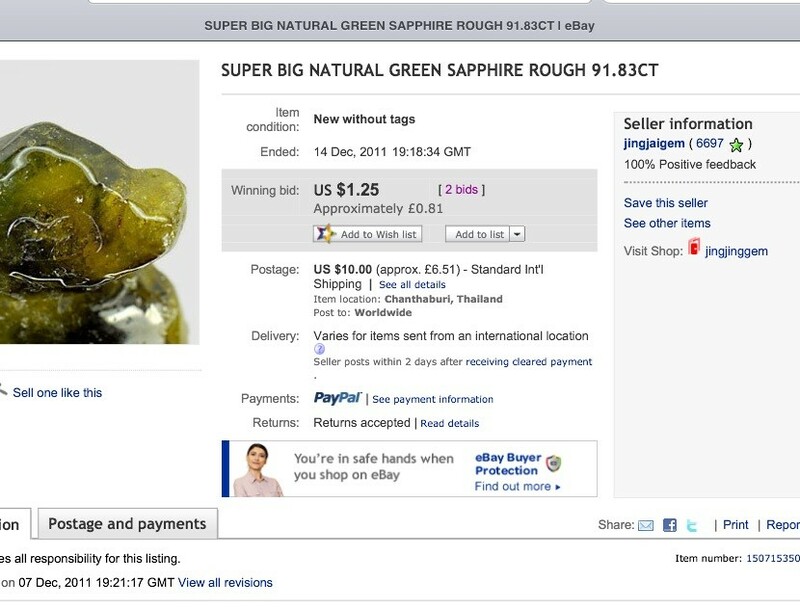 Read about the Robert James eBay fraud in our article here. This is a Gobsmacked Gang production. Certain images courtesy of FreeDigitalPhotos.net.